A simple batch cheat file that i use for Fallout 3 & Fallout New Vegas. Enables god mode, increases jump height, and removes scope sway. Gamers and Modders like you! 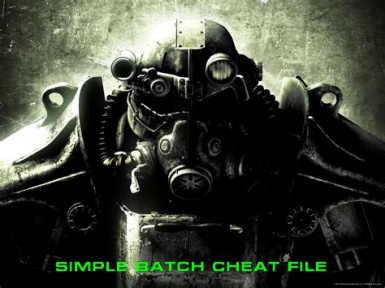 A simple batch cheat file that i use for Fallout 3 & Fallout New Vegas. Enables god mode, increases jump height, and removes scope sway. Open the console with the tilde key (~) and type in "bat cheat"(without the quotation marks) and hit "enter". Works with either Fallout 3 or Fallout New Vegas.